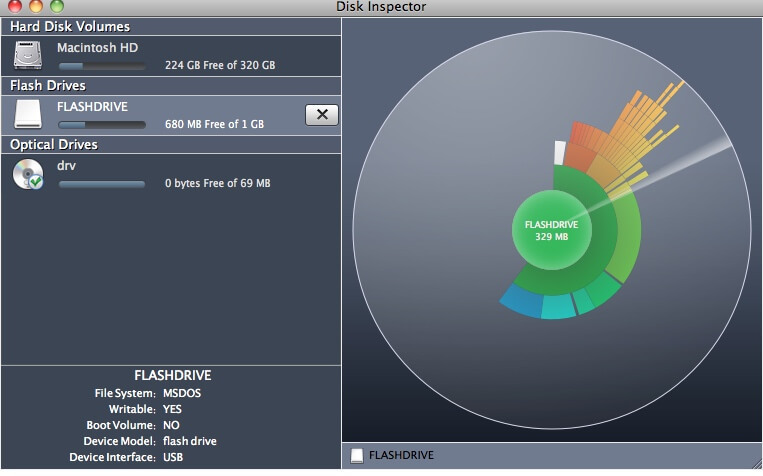 Disk Space Analyzer purpose is to help find you “space eaters” – files and folders that occupy volumes space. There can be several big unused files or tons of small unused files on a volume. To display files you should scan a disk for files structure. Select a volume and press “Scan Volume” button, or use ⌘+S shortcut. The scanning process can take from several seconds to ten minutes, depends on files and folders count and disk speed. During the scanning process, you can see animated “ray” that means scanning process. Located files are displayed in sunburst diagram mode. During disk scan process your san sees files and folders size hovering mouse cursor on them.